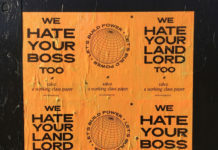 Anarchist Movement Up-To-Date Support Flyer for Political Prisoner, Bill Dunne! 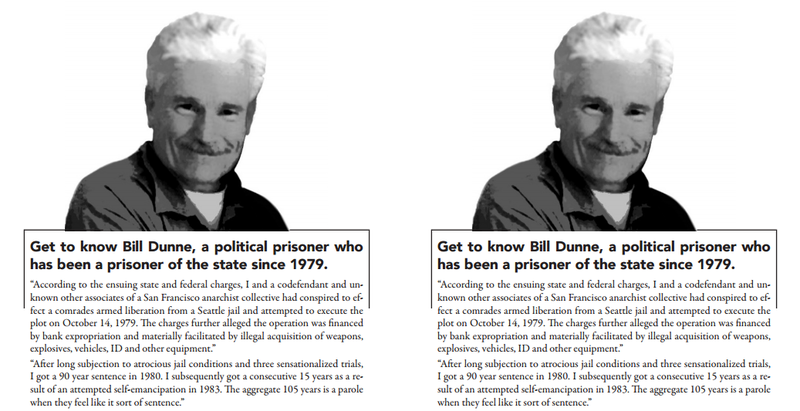 Up-To-Date Support Flyer for Political Prisoner, Bill Dunne! Bill Dunne is a long time anti-authoritarian and anarchist prisoner who since 1979, has been doing time for his involvement in an armed attempt at freeing a comrade from imprisonment. Please download and distribute this up-to-date support flyer for Bill Dunne and let us never forget our comrades on the inside. Get to know Bill Dunne, a political prisoner who has been a prisoner of the state since 1979. Ever since 1982 when Bill Dunne was banished into internal exile in the federal prison system from the Washington state system he had never seen a medium security federal prison until 2014 when he was moved from USP Pollock to FCI Herlong. Since that transfer, he has been in three different medium security federal prisons in California. In those three years Bill has gotten a lot of support, but has had to persevere through a lot along the way as well. First, he received a 15-year hit at his parole hearing in late 2014 which means he won’t get another formal parole hearing until the year 2029. 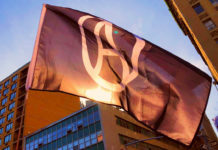 While he was still at FCI Herlong Bill was sent to the S.H.U (secure housing unit) pending an investigation after an anonymous note was said to have been received saying Bill was planning an escape. It seems much more likely that the administration was attempting to stop Bill from litigating by putting him in the S.H.U. Once a lawyer got involved Bill was moved from the S.H.U at FCI Herlong to general population at FCI Lompoc. Most recently Bill had a brief health scare while he was in the S.H.U at FCI Lompoc when a guard found him passed out in his cell he was then rushed to an outside hospital and Bill gained consciousness soon after. Bill has never stopped struggling since his arrest and imprisonment in October of 1979. The Washington state system sent him to the federal system simply for editing WPNS (Washington Prison News Service), a prisoner run newspaper. After the escape attempt in 1983 he was eventually sent to the notorious control unit of U.S.P Marion that existed at that time which was essentially a prison within a prison. After arriving there in 1985, he was there for the next 7.5 years. While he was there he edited the Marionette, an important newsletter that exposed the destructive conditions of that prison. The Marionette grew into Prison News Service which was a paper that was much more broadly focused. Also, in deep solidarity with all political prisoners and the movements they all do come from Bill has contributed to projects that work to help give a voice to political prisoners and help provide material support as well. 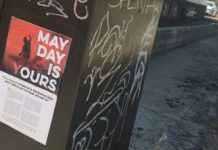 Some of those projects include 4strugglemag (4strugglemag.org), and Running Down the Walls, an annual 5k run fundraiser where all the money raised goes towards prisoners the Anarchist Black Cross does support work for. 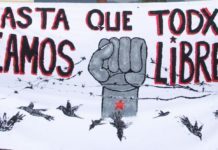 One of the easiest, and most important things we can do to support political prisoners who have kept the struggle alive after they’ve been captured and during their incarceration is expressing support and solidarity through writing a letter or getting together with a group of comrades and filling out a greeting card to send off. Bill would love to hear from all supporters, and he’d especially enjoy receiving any printed-out news articles pertaining to the struggle or even general world events that you two could engage in a discussion on. August 3rd is his birthday, a great opportunity to express solidarity and to let him know you’re thinking of him.